No, not just for the number of emails in my inbox (although that is horrifyingly substantial!) but because I begin the summer intensive course on horror film. 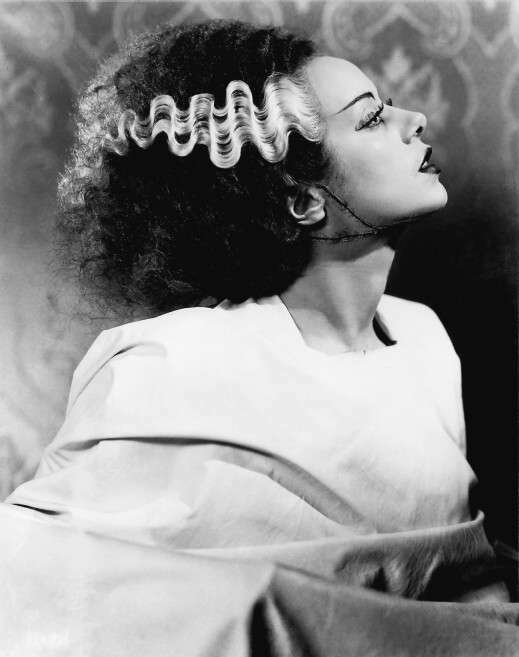 First feature today: “Bride of Frankenstein”! Isn’t this a lovely photo of Lanchester?! Along with a lot of the Universals I’ll have a few other things to show the early era, but with only twelve class periods altogether to convey the whole of horror film history, there are going to be holes. Massive holes! There it is. More later — Kalamazoo wrap-up, upcoming events, but at present haste precludes verbosity! Oh! This sounds like an interesting class… Hope you share more about it. Keeping fingers crossed, but next year I'm hoping to be able to run a module on cult & exploitation cinema. Think my little darlings are ready for the Director's Cut of Pink Flamingos? Thanks for the votes of confidence, everyone! Yes, Mikel — I think you should assume they are ready for the director’s cut and the full-on filth!Yes, my schedule is madness, self-inflicted. Three weeks of horror, a reading on the 30th and departure June 1 for a month in Britain. But after today, it should be more relaxed. I had planned to get some things done while at the conference over the weekend and did NOTHING! Well, did see friends and papers and went to meetings, but no writing. Don’t forget The Turn of the Screw. Slow, steady, and methodical, it plods towards the horrible end. I may be out of cellphone contact for the next 12 days. I will respond to posts as I am able. It will be an intensive three weeks! We ran through early films rather quickly, but I will be sacrificing much along the way.Jina, those are great stories. I showed the students the “warning” at the start of Frankenstein before we watched Bride and explained how much effect this film had in 1931.Of course we had to watch a few clips from Young Frankenstein just to see how faithfully they adapted the movies. Oh, and Jane — I do write a lot of horror, in fact my first published story was horror and won the Clive Barker Lord of Illusions short story contest. Clive chose it himself and wrote me a very beautiful and encouraging letter that I treasure. Patricia, yes I am a fan of the lit, from early Gothics to modern creepers. Among my favourite authors: Clive Barker, Ramsey Campbell, Shirley Jackson, Storm Constantine, MR James, Wilkie Collins (and many more).Dana, would love to have a student like you!Galen, I always seem to live in a mad whirl — until I’m on vacation and then I’m lazy as the day is long.